Saturated , where the fatty acid chain has no double bonds (think of the hydrocarbon chain being saturated with hydrogens. Animal products such as lard, butter, whole milk, eggs and meat are high in saturated fat. Monounsaturated fatty acids have 1 double bond. Examples of foods high in monounsaturated fat include avacado and nuts. Polyunsaturated fatty acids have multiple double bonds. Saturated fats have a higher melting point and are normally solid at room temperature (butter, animal fat, palm oil, coconut oil...), while unsaturated fats are liquid (e.g. 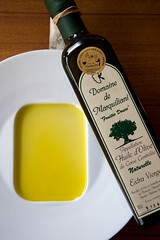 olive oil, sunflower oil, fish oil...). While fats are often thought of as unhealthy, some fat is actually necessary for good health. We need fatty acids to make and repair cell membranes, aid absorption of fat-soluble vitamins (A, D, E & K), produce hormones and provide protection and insulation of organs. Certains types of fats must be eaten as they cannot be synthesized by the body, but are needed for metabolic functioning . These are the Essential Fatty Acids. The 2 families of EFAs are omega-3 fatty acids and omega-6 fatty acids. Fish, seeds and nuts are the best sources of EFAs. Trans fat is unsaturated fat made by partial-hydrogenation of vegetable oils (for example, to produce margarine). Hydrogenation increases the melting point of the unsaturated fat which makes the oil solid, extends its shelf-life and is also useful for baking. However, this process sometimes causes the conversion of cis-double bonds of the fatty acid chain into trans-double bonds. Such a molecular structure is not normally found in high amounts in natural fats. Our bodies therefore do not process trans fats efficiently and this leads to health problems, especially cardiovascular heart disease (CHD).